Australian walling system manufacturer AFS Walling Solutions has achieved the CodeMark certification for its LOGICWALL system. CodeMark is an independent building product certification scheme administered by the Australian Building Codes Board. The CodeMark certification confirms that AFS’ LOGICWALL system is compliant with the National Construction Code (NCC) and AS3600-2009 (Concrete Structures) and evidences its suitability for use in the design of a concrete structure. AFS Technical Manager Dr Adnan Malik explains that the certification will save architects, engineers, builders, specifiers and certifiers valuable time in ensuring LOGICWALL is fully compliant and fit for purpose, benefiting key stakeholders at every stage of a construction project. Previously, AFS LOGICWALL users had to review significant documentation, test certificates and reports in a time-consuming process to confirm its compliance. A division of building products leader CSR, AFS decided to undertake CodeMark certification in continuation of its parent company’s tradition of constantly refining their internal processes, providing peace of mind for clients, and showing leadership within the construction industry. According to Dr Malik, achieving CodeMark certification means that individual durability, fire resistance, weatherproofing, acoustic and thermal performance test documentation is now confirmed in a single overarching, universally accepted document, saving time for clients. He adds that the end-to-end nature of the CodeMark certification means users can specify the LOGICWALL system with complete confidence that it complies with all relevant aspects of the National Construction Code (NCC) and AS3600-2009 (Concrete Structures). The certification also requires the principal certifier to accept that the product complies with all the relevant standards, which is of great benefit to the client. 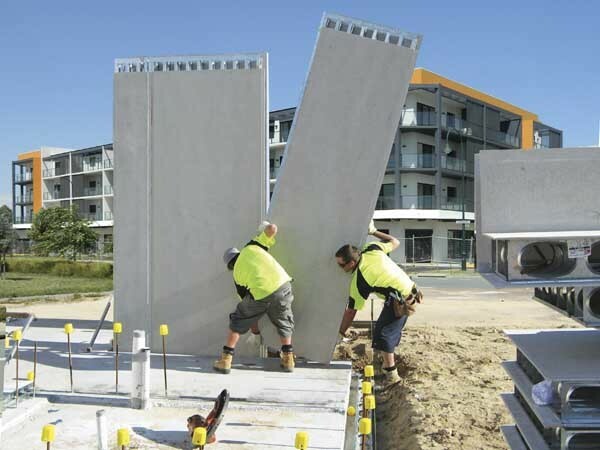 AFS’s LOGICWALL is a permanent formwork system for concrete walling in external and internal applications. Hard-wearing fibre cement sheets are bonded to galvanised steel stud frames to create lightweight sandwich panels that are used in multi-level construction projects. Some of the landmark projects that have used the LOGICWALL system include the Enoggera Barracks in Queensland; the award-winning Condor Tower in Perth; the multiple award-winning Stella Apartment development in Success, WA; East Quarter in the Sydney suburb of Hurstville; and the Lilyfield Housing Development in NSW. LOGICWALL’s CodeMark certification followed a rigorous three-month evaluation process that included a comprehensive review of production processes, site inspections, installation and independent testing. This certification has been achieved end-to-end, from manufacture to installation and confirms LOGICWALL’s suitability for use in the design of a concrete structure.